Downloaded app and then each daily issue has a price tag of $1.99 attached to it. Now I can't even get it to open. This app looks good and works well but is unreadable because of the constant half page adverts flashing on the pages. I do not mind advertising but in this case it ruins the whole experience. The trouble is that the advert is always there, everyday. I have stopped using it and will not subscribe. The news are clear, objective and fair. The app won't open, it just crashes every time. I reinstall it, then it works a couple of times and then goes back to crashing every time. I do pay for this service you know! My iPad has loads of memory left on it, so it isn't my system. Paying a subscription for this is embarrassing. Awful. 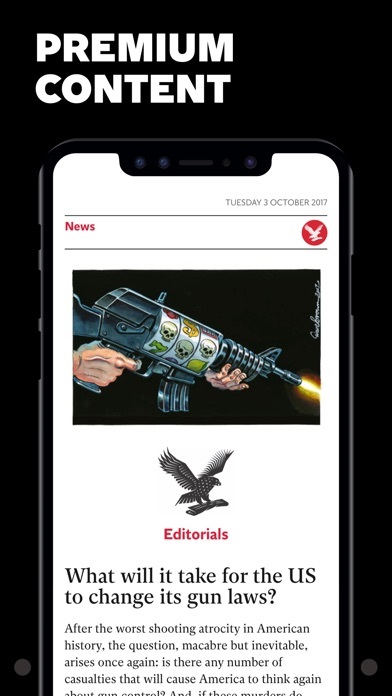 This is the worst UK newspaper app because even although you have to pay for it there is the same advert day after day which blocks the entire contents so most days you are unable to read the paper. A con! What an atrociously bad surprise this last update has been! We have the full paid version that is supposed to let us see all of the print edition of the Independent. It used to be wonderful — just like reading the print paper. Now, however, it takes forever to download, and, once you finally waste several minutes trying to get in, it is just an edited series of articles, with full page ads stuffed in between. A lot is missing! It's not much better than the free version, only glitchier and harder to navigate. What the hell have they done, and why did they have to ruin what had been such an enjoyable app? We're disappointed and disgusted. Please Independent, rethink this terrible "update"! Awful! Seriously! 1.99 for an article when you can get it for free on the Internet! Delete! I won't be using your app anymore. In case you are not aware, there are plenty of free apps on the net. Whomever decided to start charging for information that is readily available for nothing, in my opinion, is out of their mind. Why do I have to download the entire edition on iOS when I can read read it piecemeal on the web? It would be 5 stars if you didn't force me to download all the content. Love The Indy and was saddened to hear about its print demise. Subscribed in solidarity and support and have been very pleasantly surprised - I don't really recognize some of the reviews here. Paper is really easy to navigate and everything just works. There's a lot of great thoughtful content and its all nicely laid out. 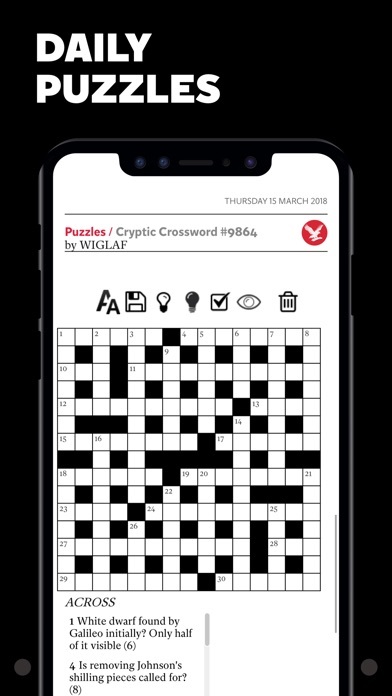 Really appreciate the crosswords and Sudoko too. Five stars for an online newspaper done well. I am appreciative of The Independent's News presentation. Excellent coverage! But nothing really great. It is a wonderful newspaper to be sure, but the app only features certain articles and I have no idea how they determine which ones to include but most are missing. So not worth paying full price per month for a fraction of the content. Too bad. Other than being slow to load, as unlike actually reading a newspaper as one can imagine, having half the print version missing, tarted up with trashy advertisements and a totally unworthy replacement for what was a very good app, there's nothing wrong with it. Perhaps you could rethink this and give us the old one back. On second thoughts, you can't rethink what was clearly not thought about. Just give us the old one - please. 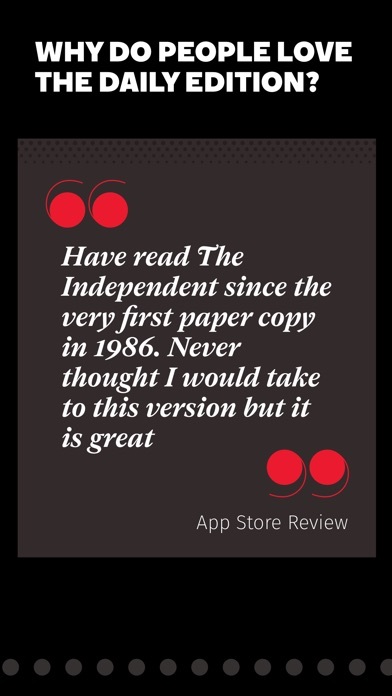 Now that The Independent is only digital, they really MUST make this app easier to navigate. They should have a look at The Guardian's app, which is, to me, the dream user-friendly newspaper app. 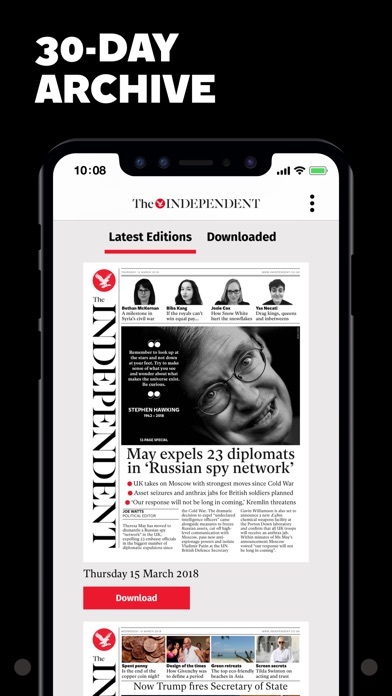 I like the independent but HATE the fact that this app displays a full page popup advertisement after every few pages that I am forced to close before reading further. And this DESPITE the fact that I pay for the subscription! To make matters worse its always the same ad. Please fire your marketing director. He's a moron that's loosing you customers. Boo! It's free online but it costs beaucoup $$'s on a mobile device. Nope. I'd give them ZERO stars if I could. Count on The Independent to carry the pertinent news in an unbiased way, and it's fun most of the time. It's the paper I buy when I'm in London, alas, not often enough! Would be 5 stars if problem fixed. Too annoying to be true! Animated ad appears all too often and is very distracting. In today's edition the same story is repeated on page 3 and 4 of UK news. No less than six articles from yesterday's edition appear in today's. Four articles about the UK appear in the World News section. There are only 5 articles about world news in the whole paper. Canceling subscription now. Even two stars may be too many! The only way to get anything is to pay $2.99 PER DAY. This is ridiculous... no other news site pulls this type of thing. I love the Independent's news stories, but why do they exist free online and so expensively on the app???? While charging $1.99 for an article is definitely a rip off, if you subscribe to the full paper then it is well worth it. The first and only newspaper I open of a morning. Awful. Just awful. Difficult to navigate and very slow. The iPhone version is my favorite news app, but this new iPad version is an abomination. I’ve given up on this. Missing pages, crashes constantly - who’s running this show? A clunky failure. Crashed almost every time I tried to access. I'm sorry I subscribed for a month. 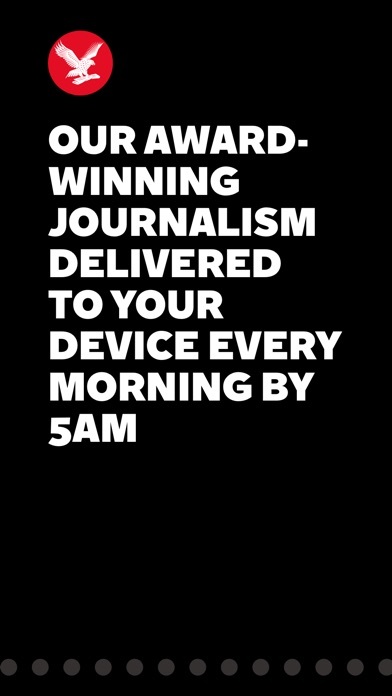 An excellent newspaper but a thieving, embarrassing app. OK, so the "app" is free, but it is useless unless you pay for content. Good bye.